Monica’s husband Simon had this dream for 30 years. The opportunity to go arose after their three children had left school and home. 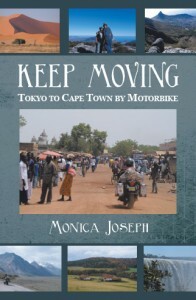 Monica had a motorcycle license but no mechanical skills and very little riding experience. She didn’t even have a motorcycle. At the end of a focused year of preparation sandwiched between two busy jobs as a social worker she was more or less ready to go. 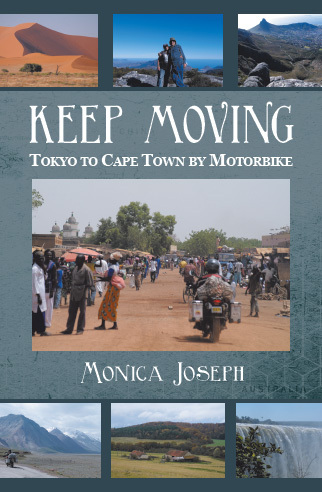 The original plan was to ride from Tokyo, Japan to St. Petersburg, Russia via Mongolia and the Central Asian Republics. The twists and turns of fate saw them return home through Africa, which had never been part of the plan. From the fabled Silk Road route to Timbuktu there was plenty of adventure and challenges. After 50,000kms and through 30 countries Monica missed out on learning how to change a tyre as she didn’t even manage to get a flat. The trip was one of extreme travel and adventure and a wonderful way of spending a year. Monica and Simon managed to return home still married and keen to travel more.